The Hot Hall may have been divided into three rooms – called calderia by the Romans – and would have been heated to about 40°, a bit like a modern sauna. This was the hottest area in the baths. The hot water and steamy air opened bathers’ pores – water and air temperatures may have risen above 40°C, with a sticky 100% humidity to exaggerate the effect. This room, like the tepidarium, was heated by the hypocaust, the baths’ central heating system. 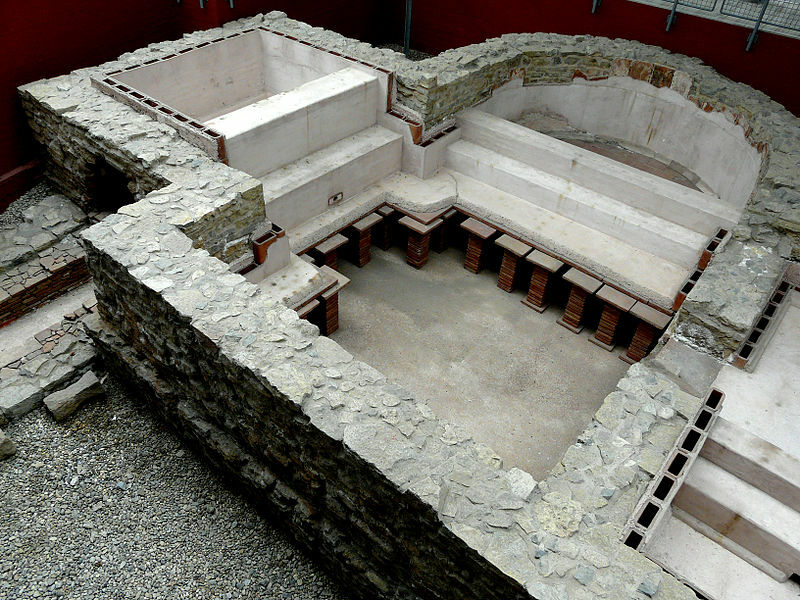 The hypocaust channelled air heated by the furnaces under the floor of the Hot Hall – bathers would have probably worn sandals or wooden clogs so as not to scorch their feet. Hot air then rose up through hollowed-out bricks that lined the walls before exiting through chimneys. Warm and hot water for the tepidarium and hot hall was also heated by the furnaces. The baths may have had one side for men, one for women; walls, movable partitions or curtains could divide the hall across the middle – we have no way of knowing if this was actually done here. In a small city like Ratae the authorities may have simply designated certain days of the week for men and women. Light for this large complex probably came from semi-circular windows set high in the ends of the three halls. Cast glass would be used – it is much thicker than modern sheet glass. Together with the thickness of the walls and the curved vaulted ceilings, the glass would help to reduce condensation, a major problem in large sauna-like baths in a cool climate.